The final month of our 6 month cruising plan wasn’t a tough one, but was definitely a fun one. As September started, the forest fire smoke faded fast from the San Juans and we spent a relaxing 5 days in Garrison Bay with the Puget Sound Cruising Club raftup. It was great to spend some time with people we don’t get to see often, in a beautiful setting. 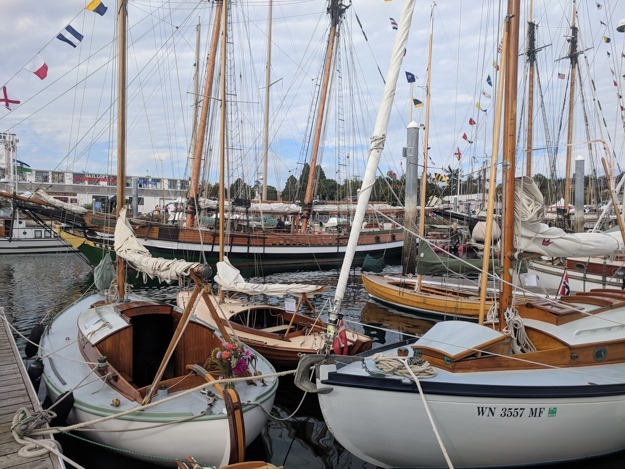 Shortly after that we stopped by the Port Townsend Wooden Boat Festival, drawing inspiration from the abundant passion of the sailors there. Especially exciting was seeing the Sail Like a Girl presentation (winners of the 2018 Race 2 Alaska, which we had followed from the Central Coast). Following that we took a week and a half break to visit family on the east coast for my sister’s wedding. The remainder of September we had a week of fun, easy Puget Sound cruising before it came time to winterize the boat (our land/air/sea travels are beginning soon!). 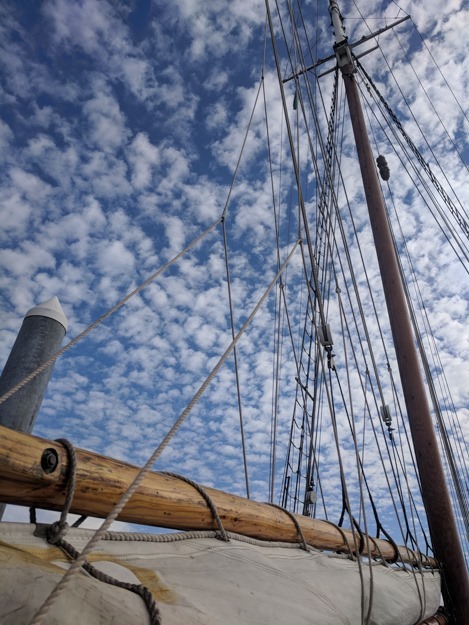 So we didn’t go very far – about 200 nautical miles – but had a lot of fun socializing with other sailors and enjoying some great sailing with wind returning and anchorages emptying out. 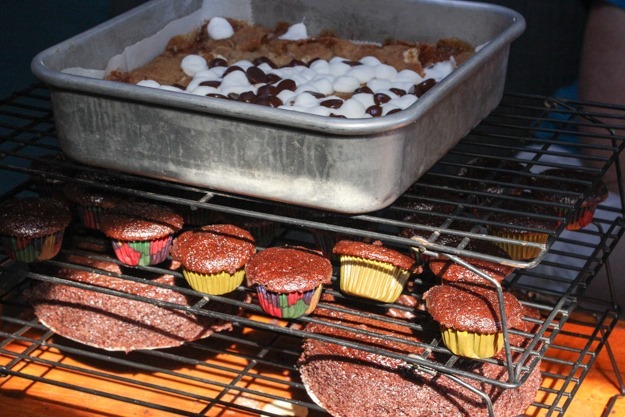 Natalie made three different desserts for the PSCC raftup! The weather in September was significantly better than August. The forest fire smoke cleared and crisp fall air moved in, providing great visibility and views of the mountains. In the 3rd week we had a string of 70+ degree days with sun, blue skies and 10-15 knot wind. Nights started to get chilly, but not enough to need a heater yet. We had some rain, but it was relatively short-lived – 3/4 of our days were rain-free. Wind was much better in September than August, as would be expected for the region. In Puget Sound, southerly and northerly phases alternated, with typically one calm day in between. Unfortunately when we were heading south we had southerlies, and when we were heading north we had northerly wind – so we sailed upwind 100% of the time in September! As is typical, southerly wind was a bit stronger – 20 – 25 knots at times – versus northerly wind usually being 5 – 12 knots. But we didn’t have to worry about any gales coming through – those typically hold off till late October or November. 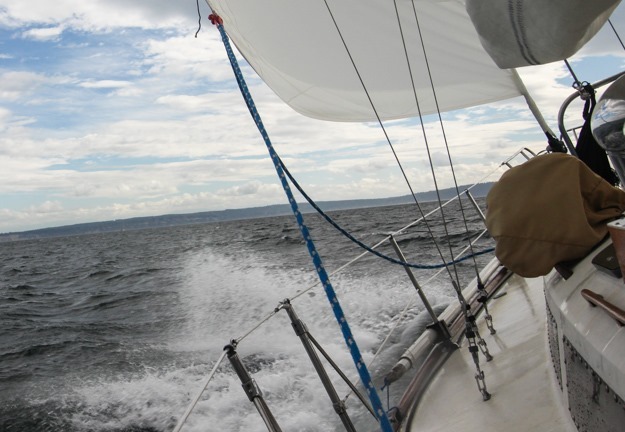 Sailing upwind in 20-25 knots from Port Ludlow to Kingston. 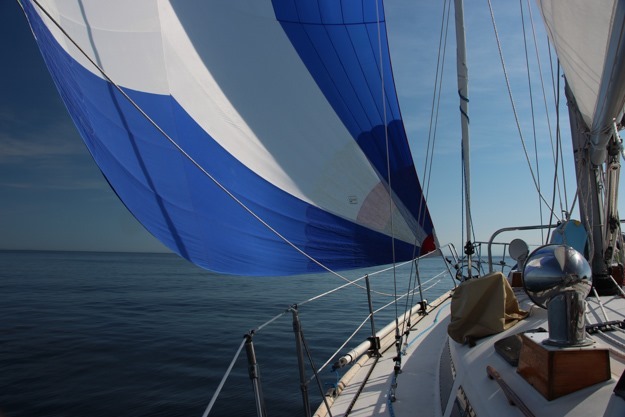 Pretty much every time we cross the eastern Strait of Juan de Fuca we have a difficult time doing it under sail. 9 times out of 10 we have less than 5 knots of wind, and have never had more than 15 knots. Our best crossing actually (100% sailed) was going north this year in late March. This year we were optimistic though and waited an extra day in Mackaye Harbor for the day where most models were predicting 15 knots starting at 7am and building to 20-25 in the afternoon and evening. NOAA issued a gale warning for 25-35 starting at noon. Guess how much wind we had at 2pm? 2 knots! Spinnaker all the way (and about 2-3 hours of motoring). Sailing during a gale warning on the eastern Strait. We did have some fun in 10-15 after Point Wilson. 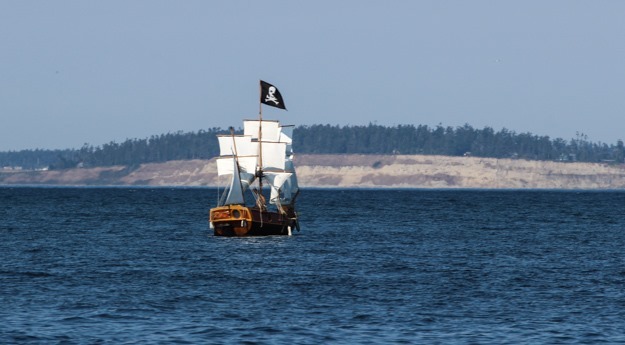 We know not to tempt fate though – the Strait of Juan de Fuca could be miserable in a real gale. We’ve just had many times where wind was forecast for the eastern strait but arrived much later than forecast. 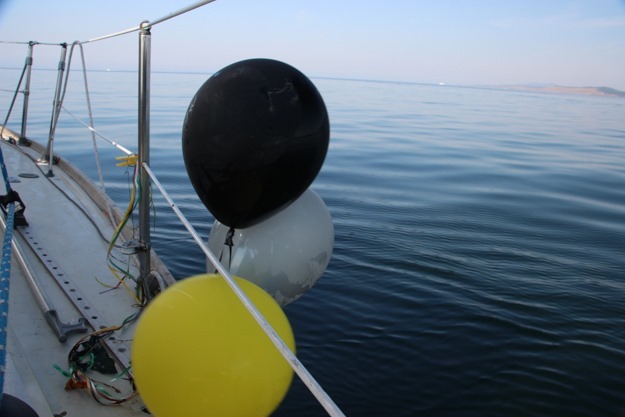 We rescued these balloons from the Strait, slightly south of Mackaye Harbor. Be careful not to lose your balloons at a party, because they often choke seals or other marine life! Towards the end of the month we stayed at Blake Island in the little marina for 4 days. We initially planned on 3 days, but the weather was brilliant and we were having fun hiking every morning plus making progress on cleaning up the boat for winterization. 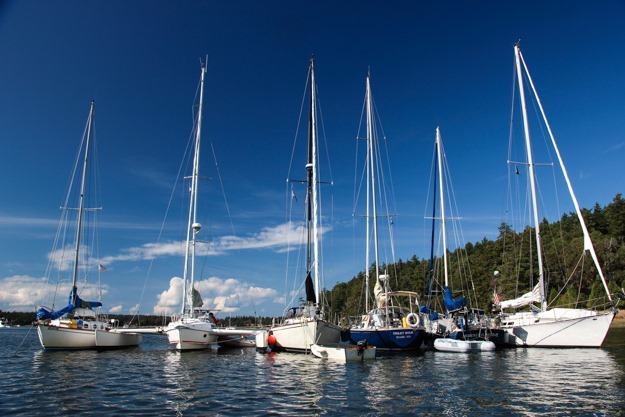 For the end of September Blake Island was still quite busy – 100% full in the marina on the weekend. But the weekdays are becoming very chill and the anchorages around here are usually empty. Although the season is winding down, September is still a really good month for cruising. 6 months turned out to be perfect – enough time to fully settle into cruising as a way of life, while still avoiding the winter storms and most of the cold, rainy dark days associated with off-season PNW sailing. Now that it’s over we’re a bit sad, and also overwhelmed by how awesome it was. We saw beauty beyond comprehension, more adventure than we ever expected, and settled into a quiet, simple way of living – connected to a natural world that just feels right. It really blows the mind to think of how much beauty there is up here in the Pacific Northwest and how we only touched the surface of it in 6 months. We saw a lot, but there are still anchorages we skipped and places we hope to sail further to some day. When they say there’s a lifetime worth of cruising up here, they’re not kidding. I kept some stats for each month we cruised: Month 1, Month 2, Month 3, Month 4, Month 5. It’s interesting to look at the big picture summary of all 6 months too though. The biggest thing that sticks out to me is how having a lot of time enabled us to sail most of the time – we put very few hours on the engine, used comparatively little diesel, and had a lot more fun sailing than motoring. We also covered a lot of distance even though we weren’t really trying to. We had a go slow, take things easy philosophy, yet the natural rhythm of sailing a bit each day over a long period of time meant we still ended up covering a lot of distance. Our month 1 (April) travels (direct line distance, not sailed route). It’s hard to say goodbye (temporarily), but we know the winter storms are coming soon, and it’s a good time to start phase 2 of our adventure – taking a 3-week trans-pacific cruise ship to Australia and then traveling Australia, New Zealand, South and Central America, and Mexico for the winter. This blog will go mostly dormant for a while – but stay tuned in the spring when we’ll be working on plans for another big season of cruising! This entry was posted in cruises, summary on October 2, 2018 by Patrick. I was just looking at transpacific cruises the other day since a bazillion hours on a plane just go get eaten by a great white shark didn’t appeal to me. I hadn’t realized before there were repositioning cruises going that way. And pretty cheap too considering. How are you getting back? Getting back we’re going to do by shorter hops on planes towards Seattle (something like NZ -> Santiago Chile, Peru, Costa Rica, Mexico, SEA). Thanks for the input, maybe I’ll do a couple photography-only posts from our travels. Just don’t want to take away from the focus on sailing. Thanks for the blog, has been very interesting to read about sailing in a cooler location. All our sailing has been from Sydney to North Queensland and back, twice for six months each time. Much warmer as you would imagine. When do you get to Sydney if that is where the cruise ends? Happy to show you around away from the city if I am free. Wow, that looks like a long trip up the coast. We’ll be in Sydney Oct 27 – Nov 2. On the 31st we’re renting a car to go to the Blue Mountains.